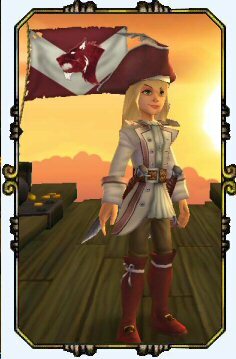 Victoria achieved the status of a level 16 Swashbuckler before the Beta Spiral was shut down. 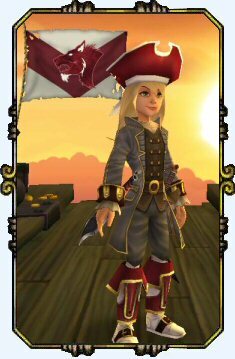 Victoria is my third character in the Pirate101 Closed Beta Test. She’s a combination of the best parts of my first two beta pirates. Victoria is currently Pirating in the world of Monquista with her First Mate Subodai – A Horse Warrior from Mooshu. Her ship colors are Burgundy (dark red) and white. 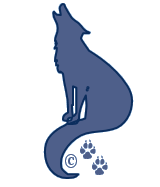 And her pirate signature flag honors her love of the wolf and his nice sharp teeth. Victoria has a tendency to howl at the moon on a bright night in the skyways. So what better image than the wolf to represent her ship and crew. Before she left beta she had acquired a wonderful light skiff called the Laughing Tiger. It was hard giving that ship up. But new adventures have brought new modes of travel. Companions are great to have in a fight, but having a favored pet to snuggle with is also good to have by your side. Victoria is looking forward to finding the right little guy to run by her side. 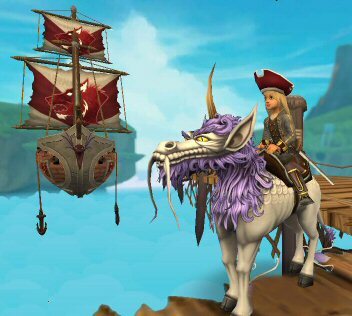 In beta Victoria was proud to have a Thunderous Kirin to ride through the islands in the spiral. And we have him back in the latest Beta version too. A Thunderous Kirin – Victoria proudly named him Artemis (as in the 3 Musketeer). She is currently living in her Pirate quarters on Skull Island.